The Neat Company, a provider of software for small businesses to track and manage their expenses and spending, has made its application available to purchase through the Apps for QuickBooks® Desktop Marketplace. Neat has been a long-time partner of QuickBooks through its QuickBooks Online integration and availability in the QBO Apps Marketplace but recently released its QuickBooks Desktop (QBD) integration in mid-2017 and subsequently made its software available through the apps marketplace in late 2017. The release of Neat’s QBD integration marked an important milestone for the company as Neat has been focused on delivering a next generation web application that replaces its Desktop (sunset) and Lightweight Desktop application in 2018. While Neat’s focus is on the cloud, the company has developed technologies that allow applications like QuickBooks Desktop along with personal and workgroup document scanners to communicate with the application. Said Neat President Michael Crincoli; “Not unlike Intuit and the QuickBooks community, Neat also has had to contend with managing a large client base on multiple versions of an app such as desktop and cloud. We see how important QBD is to its large user base and we wanted to set ourselves apart from other apps in our space by providing a great integration to this popular version of QuickBooks”. The Neat software app acts as a ‘pre-accounting’ solution designed and priced for small business owners, entrepreneurs and individuals such as 1099’ers. Neat allows users to use any scanner, a mobile phone camera or email to upload business documents such as invoices, expenses and receipts into the app. Once loaded, Neat’s proprietary ID2™ (InDocument Identification) technology parses information from the documents that is necessary for apps like QuickBooks to do its accounting processes. 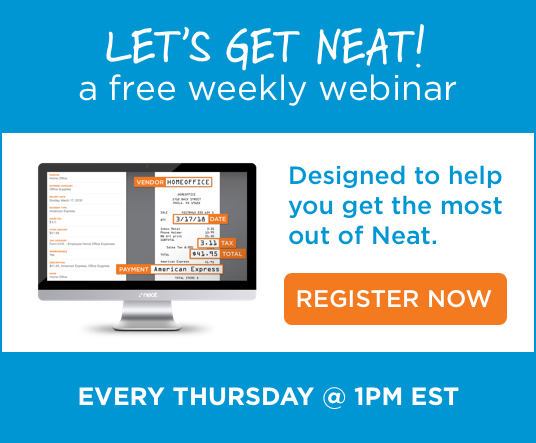 Today, Neat is used by thousands of QuickBooks ProAdvisors and over 10,000 QuickBooks users in North America. Neat also provides a comprehensive Accounting and Bookkeeping partner program that enables QuickBooks ProAdvisors the opportunity to resell and/or use Neat on behalf of their clients to streamline the flow of financial information into QuickBooks.